This is a comparison of 5 different electric toothbrush models from Oral-B. They have been combined into 1 comparison, because they are similarly named and very similarly featured. It is the Oral-B Genius Pro 8000 & 9600 that are designed for and have been launched within the USA. The Genius 8900, 9000 and 9900 are models that have been designed for and launched within Europe. Although technically possible to import these to the USA and use them here (different charging stands would be required), they have not been launched or sold in the US by Oral-B. To further complicate matters, in Europe, there is too the Genius 8000, but it is different to the US model. The European Genius 8000 is not as feature rich as the US model. As you can probably then understand, in this comparison, we do go on to further explain all the differences, but because ONLY THE GENIUS PRO 8000 and Genius 9600 are available in the USA, as such there are the only models we can recommend. Of these 2, it is the 8000 that is the better brush in our opinion. You get more, for less money. You can read our Genius Pro 8000 review here. You can read our Genius 9600 review here. The Oral-B Genius Pro 8000 is the brush to go for. 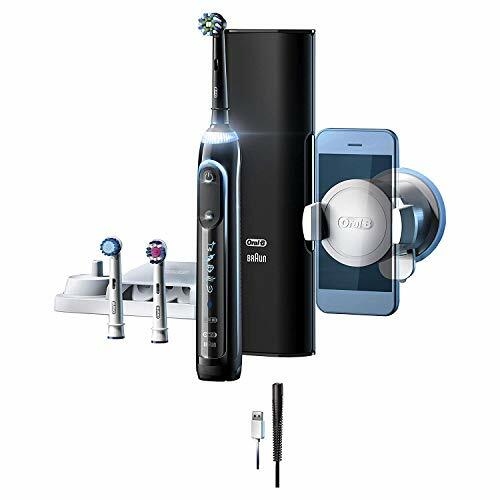 It is a flagship Oral-B electric toothbrush that as you would expect cleans the teeth really well, but benefits from many other features including multiple cleaning modes, pressure sensor, good box contents, Bluetooth connectivity and much more. For a closer look and a hands-on video, see our Oral-B Genius Pro 8000 Review. Below we have listed the key differences between these models. The 9600 has a new style charging stand, that comes with a detachable power cable, that works with the smart travel case too. The 8000 on the other hand has a plug hardwired into the charging stand and a separate power cable specifically for the smart travel case. The 9600 comes in a Sakura Pink color option, not available with Genius Pro 8000. The 9600 comes with 1 of the new style Sensi UltraThin brush heads compared to the standard sensitive brush head with the Genius Pro 8000. The Genius Pro 8000 comes with a brush storage compartment that holds up to 4 brush heads, the 9600 does not have this. The Genius 9600 tends to be the more expensive brush. Another claimed benefit of the 9600 is the addition of ‘Gum Guard’ or ‘Gum Protection Technology’. The idea is that it helps reduce bleeding gums. This is actually a feature of the smartphone application which is available to both owners of the Genius Pro 8000 and 9600. The Genius 9000 was a model launched for the European market and not the USA. Although the Genius 9000 sounds superior to the Genius Pro 8000 (USA), it is essentially the same brush. The Genius 9000 comes with a charging stand that supports 220-240v (European voltage) and a 2 pin plug (for UK bathrooms or European sockets) not the 120v and 2 pin plug for the USA. The Genius 9000 is available in Silver, a color option not available on the 8000. The Genius Pro 8000 (USA) comes with 3 brush heads supplied (1 x CrossAction, 1 x 3D White & 1 x Sensitive) whereas the Genius 9000 comes with 4 brush heads supplied (2 x CrossAction, 1 x 3D White & 1 x Sensitive). The Genius Pro 8000 (USA) has 6 cleaning modes including a tongue cleaning mode that the 5 mode 8000 (UK/Europe) does not have. The 8000 (UK/Europe) comes with one basic plastic travel case but the Genius Pro 8000 (USA) offers a premium travel case which allows you to charge your brush in the case as well as charge a USB powered device such as a smartphone from it too. The Genius 8000 (UK/Europe) is available in Silver/White color whilst the 8000 (USA) is available in Black, White, Rose Gold and Orchid Purple. The 8000 (UK/Europe) comes with a charging stand that supports 220-240v (European voltage) and a 2 pin plug (for UK bathrooms or European sockets) whereas the 8000 (USA) comes with the 2 pin 120v charging stand for the US. The Genius 8900 was a model launched for the European market and not the USA. Although the 8900 model number implies it is superior to the 8000, it has in fact lesser features and box contents as the model numbers in Europe are different. The Genius 8900 has 2 brush handles in the box compared to the one with the Genius 8000. The Genius 8000 has a tongue cleaning mode that the 8900 does not have. The 8900 comes with one basic plastic travel case but the 8000 offers a premium travel case which allows you to charge your brush in the case as well as charge a USB powered device such as a smartphone from it too. The Genius 8900 is available in Silver/White color whilst the 8000 is available in Black, White, Rose Gold and Orchid Purple. The 8900 comes with a charging stand that supports 220-240v (European voltage) and a 2 pin plug (for UK bathrooms or European sockets) not the 120v and 2 pin plug for the USA. The Genius 99000 was a model launched for the European market and not the USA. The Genius 9900 comes with a charging stand that supports 220-240v (European voltage) and a 2 pin plug (for UK bathrooms or European sockets) whereas the 8000 (USA) comes with the 2 pin 120v charging stand for the US. The Genius 9900 has 2 brush handles in the box compared to the one with the Genius 8000 (USA). The Genius Pro 8000 (USA) is is available in Black, White, Rose Gold and Orchid Purple, whilst the Genius 9900 has 1 handle in Rose Gold and 1 handle in Black color. All being well the lists above should make clear how the various models differ and as a US resident you should only pay attention to the Genius Pro 8000 or 9600. But of the 2, it is the Genius 8000 that is our choice. Is the Oral-b Genius 8000 travel case can charge the toothbrush? The Oral-B Genius Pro purchased in the USA comes with a travel case that allows the brush to be charged, whilst it is inside the case. A power cable does need to be connected in order for it to charge. Great review Can we share this with my spouse. I mean the British as well as the app? Sorry, I am not sure what you mean exactly. Do you mean share to the toothbrush handle? There is a way for 2 users to share a brush handle and still connect to the app on each of your smartphones, but in my opinion, it is far from an ideal setup. Does the charging station separate from the brush holder on the 8000?